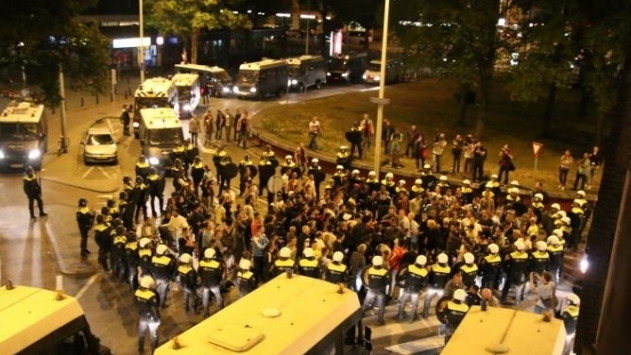 This week several anarchists in the city of The Hague, The Netherlands and other cities, received police visits. The police delivered letters containing the intentions of mayor Jozias van Aartsen to prohibit anarchists from setting foot in the Schilderswijk neighbourhood in The Hague for the coming two months. The letters stated that the anarchists were to blame for “structural nuisance”. This nuisance would consist of unannounced demonstrations, disturbing of the peace and the disturbing of demonstrations. The letters contain a list of allegations to which people are being associated to or for which they have been arrested. These allegations differ per person. They range from squatting, participation in spontaneous demonstrations, pasting posters and destroying a prison fence. What the anarchists have in common is that they are all active against institutionalised racism, ethnic profiling and the racist The Hague police force. All of them were also preemptively arrested on the 27th of June, after a demonstration commemorating Mitch Henriquez who was murdered by police last year. The letter also states that “there was a presence of people associated with Anti-Fascist Action (AFA)” during the four nights of rioting last year after the police murder on Mitch Henriquez, and that they “had an inciting and catalysing role in escalating the demonstration to the point of a riot”. It is also claimed that people linked to AFA “have breached the peace multiple times in the Schilderswijk”. That the contents of these letters is mainly based on presumptions and vague accusations does not surprise us. Neither does the fact that a lot of these accusations have themselves been dropped by the public prosecutor because they were simply not concrete enough for a prosecution. The accumulation of lose and distant events, the speculation and framing of anarchists is nothing new. We can see this happening in a wider international context against anarchists in Brussels, Spain and Italy, where they are being accused for being members of “subversive” or “terrorist” organisations. In The Hague repression is nothing new. Besides all the preemptive arrests, the stalking of anarchists on the streets and the attempts of infiltration, an eight week jail sentence was demanded for a comrade who was suspected of pasting an Anarchist Wallpaper. How many people have had their movement restricted is still uncertain. This is because the police is still searching for people to whom they have to deliver the letter. The juridical grounds on which this area ban is based is the so called “Football Law” (art. 172a) which came into effect in 2010. It was meant to be used during football matches to restrict the movement of “hooligans”. This is the first time it has been used against activists and anarchists. The public prosecutor announced that there will be a decision whether the police officers who murdered Mitch Henriquez will be prosecuted by the end of the summer. Again it comes as no surprise that the restriction of movement continues until the end of summer. We will continue our struggle for freedom and anarchy. No restrictions, police or scum like mayor Jozias van Aartsen will stop us in this. What the anarchists have in common is that they are all active against institutionalised racism, ethnic profiling and the racist The Hague police force. Solidarity--was their database simply those that have been arrested on demos or does it seem to be broader than that? I cannot look inside the brain of the mayor and his advisors But the forbidden area, the Schilderswijk in The Hague, is a poor migrant neighbourhood with lots of tension confrontations between police and parts of the population. Anarchists have been trying to build solidarity and help with resistance for years. There was full-scale revolt for four days in summer 2015, after cops killed a Aruban man (Aruba is part of the (not-entirely-former) colonial empire of the Netherlands). A few months ago, one anarchist was arrested in the neighbourhood for putting up posters with an wallpaper in wich that revolt was defended, and dragged before a court, accused of 'enticement to violence'. The comrade was acquitted but the state is appealing the verdict. I think the area ban is an effort by the state to hinder anarchist efforts to buld solidariity in/ with the communities living in the Schilderswijk. The ban is for two months. Probably not coincidentally, within these months the state probably will decide wether to prosecute the cops who killed the Aruban man. The ban seems to be a pre-emptive strike against possible support for coming outburst of anger. Internationally Fascism and Fascists have raised their ugly heads yet once again clothing themselves in "democratic libertarian rhetoric"
Who does this guy think he is, Karl Marx?